Caroline, Or Change has been such a roaring success that it is almost impossible to get a ticket other than a return for its run at the Hampstead Theatre. I was lucky enough to get such a ticket, and it was well worth the wait. However, there is no excuse to miss this show as it will be transferring to the West End's Playhouse Theatre between 20th November and 9th February. It is appearing in the Hampstead Theatre as a transfer from Chichester Festival Theatre, which seems to be the home of great West End transfers such as Gypsy, Guys and Dolls, and Half A Sixpence. The through-composed musical (meaning that there is no dialogue - everything is sung) has music by Jeanine Tesori and lyrics & book by Tony Kushner. It is based in the home of a Jewish family in Louisiana, 1963. Noah is a young boy who looks up to and admires his black maid Caroline. In order to teach Noah the value of money, his stepmother introduces a rule: any loose change that Noah leaves in the pockets of his trousers when he puts them in the wash can be kept by Caroline. Although initially Caroline is angry that her boss has considered her so desperate that she would be willing to steal money from a young boy, she eventually takes the money. Seeing this, Noah purposefully leaves money in his pockets every day, encouraged by his fantasy that Caroline and her children will be talking about him. However this scheme of Noah's proves to be difficult for Caroline as she wrestles with the morals of the situation. The music lifts the text, swooping from klezmer at the Chanukah Party to the blues in the kitchen where Caroline, Emmie and Dotty are preparing the meal. The design of the production is also incredibly clever, with the house split in the middle leaving Noah on one side and his father and stepmother on the other, showing how the family has been broken apart after the death of Noah's mother. The cast is superb. Abiona Omonua as Emmie, Caroline's eldest daughter who is hungry for political change, has some wonderful songs which she delivers exceptionally well and Naana Agyei-Ampadu playing Caroline's friend Dotty has a wonderful voice! 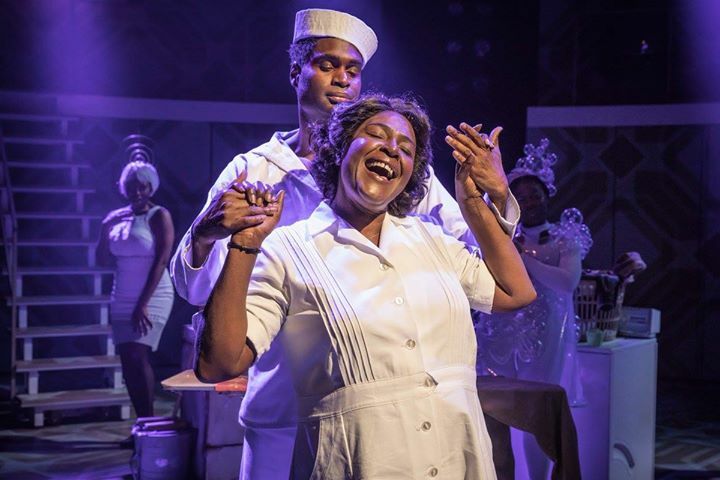 Much praise has been given to Sharon D. Clarke for her outstanding performance as Caroline, and she deserves all of it and more. A character has never been more real. You can see the pain she has suffered in her eyes and the weight of the hardship she has endured as a result of racism and poverty visibly drag her down as she moves between the washing machine and the dryer, back and forth. The musical has been written and designed so well that not an eyebrow is raised at a singing dryer or washing machine (a brilliant Me'sha Bryan) dressed in the most wonderful bubble wrap outfit with a magnificent bubble headpiece. In fact, I found myself thinking "why on earth do household objects not come to life in every musical?". This really is a great musical and is guaranteed to be a hit with any musical lover. The top-class writing and breath-taking performances is a sure recipe for success!